I feel like it’s a seasonal thing, because it’s totally that transitional time of year. I love the winter…and was thrilled that we finally had a snow day here in Memphis on Monday. But now that we’re getting previews of spring-like weather, it makes me look forward to being outdoors! The thing I’m most look forward to? Getting to sit outside on our patio for breakfast in the mornings or a cocktail in the afternoons to unwind. I have become a total homebody in recent years, and our patio is definitely my favorite place to be. The thing I’m least looking forward to? Bathing suits. I’m just not quite there. Still trekking along with my weight loss goal – but certainly not the size (or shade – hellooooo Casper!) I’d ideally like to be for “public viewing”. If you’re in the same boat and are trying to shed a few pounds, I have a great recipe for you. It might seem a little complicated, but I assure you, it comes together very quickly and is probably something you could find at a nice restaurant along the coast. Now you can make it at home. While wearing stretchy pants…if you want to wear pants at all – I don’t judge here. The point is – restaurant quality food cheaper and without the whole hassle of going out. Told you – total homebody. I think this would be okay with any of the milder white fishes – grouper, flounder, etc. 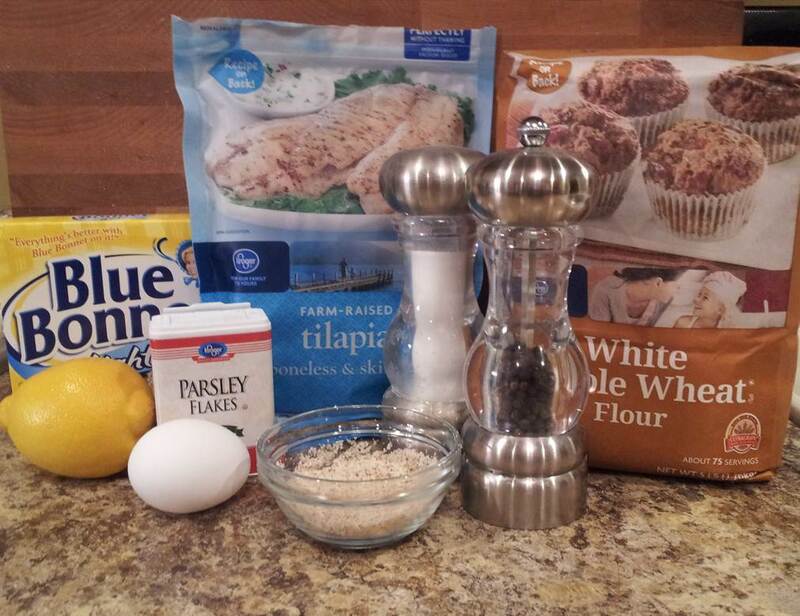 but I tested this one out with Tilapia and am a huge fan. So the toughest part of this recipe, in my humble opinion, was dealing with the almonds. Honestly, not that difficult. You need about 2 1/2 Tbsp. of ground almond. I just threw about 1/4 cup in a food processor until it was coarse. However, we didn’t have sliced almonds, so I attempted to slice my own, which almost got a bonus slice of thumb. I don’t recommend that – so just chop some into big chunks if you don’t have the pre-sliced ones. The things I do for y’all. Anyways – take your sliced or chopped almonds (thumb free) and toast them for 5 minutes at 350 in your oven. Remove and set aside. Take your ground almonds, add the lemon zest, a few dashes of salt and pepper, and the flour in a shallow dish/plate. 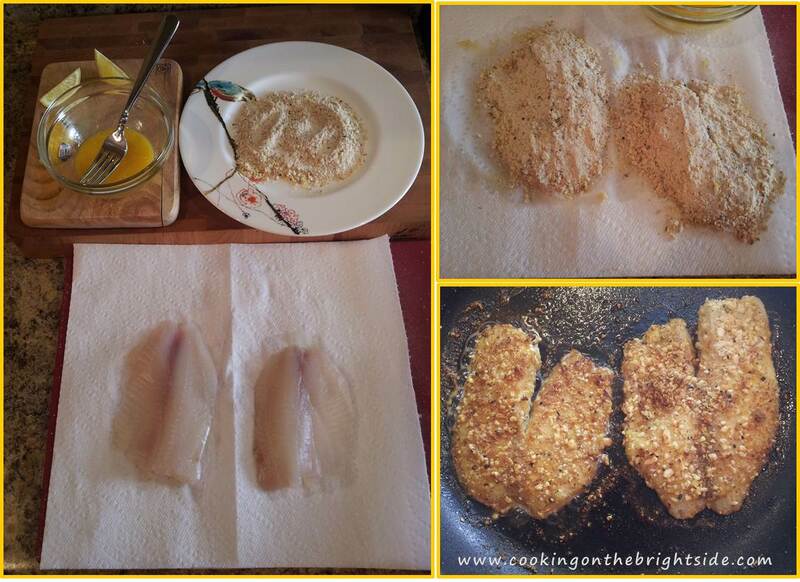 Set your fish out next to the almond mixture and your egg yolk. Pat fish dry and brush the tops with egg yolk. Press yolk-side down into the almond mixture to coat. Yes – you only want one half of the fish coated. Melt half of your butter in a medium skillet over medium heat. Add fish fillets, coating side down and cook 4-5 minutes until lightly browned. Season the bare sides with some more salt and pepper. Just before flipping, add the remaining butter and saute the non-coated side for another 3-4 minutes (depending on thickness of the fish). 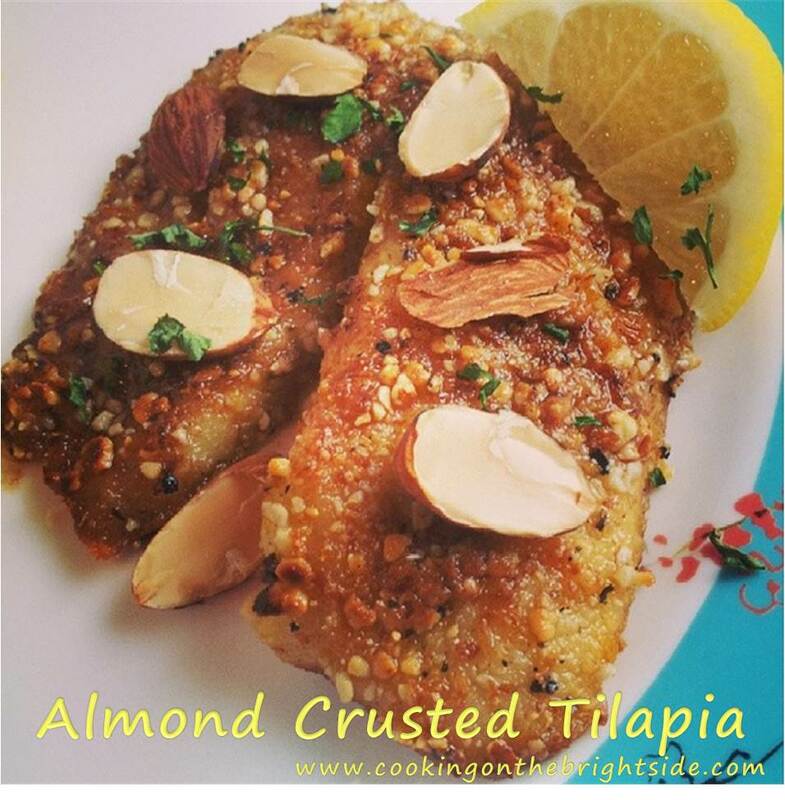 Remove fish, spoon remaining butter over the top and sprinkle with toasted almonds and parsley. And voila. This went great with some seasoned sliced potatoes and artichoke hearts heated up with some butter and lemon juice.